"From Northwest China’s Xinjiang travel westwards in the beautiful season of the year for that region, visiting the true Central Asian culture & nature, then by land cross into the attractive country of Kyrgyzstan" - A 17-day fascination of Central Asia expedition! Another non-commercial, enchanting, uniquely tailor-made expedition done - From China's Shangri-La along the LanCang/Mekong River into Laos" (see photo-diaries page). Our travel friends with a discerning taste enjoyed yet another fascinating: "Train through the WonderLands" - A Cultural/Photographic Expedition to the Southwest... (see photo-diary). "A Journey by Train to the Top of the World"! From Beijing by train all the way to Tibet region, then cross into Nepal, by plane to Hong Kong... (see photo-diary). "A special XinJiang Cultural/Photographic Expedition" to a part of the unique Northwestern China, the true Central Asia region! For July 2016, we will have a one-of-a-kind Cultural/Photographic Expedition to the Inner Mongolian region & more... (see photo-diary). Yau-Sun Tong is invited as one of the main speakers to present a photographic slideshow in the Photo Moncton International, taking place September 10-13. Again a successful special expedition "Culture & Nature on Top of the World" - Tibet!" completed, you may enjoy our photo-diary! Our another extraordinary Special Chinese New Year Season Cultural/Photographic Expedition with a richly new itinerary; to enjoy the topics of Health & Longevity, Origin of Tea, Cultural Festivals, Culinary Delights, unique UNESCO sites, and more... (see photo-diary). A well received slideshow "Slide film in the Digital Age" was given by Yau-Sun Tong in the Nova Scotia Museum of Natural History auditorium, with images taken from around the world. It was a full house attendance! Yau-Sun Tong's slideshow presentation - "The Fabled Northwest Frontier of China" was well received in Moncton, New Brunswick, hosted by the Moncton Focus Camera Club. Yau-Sun Tong was invited to present his "Fascinating Southwest China" real film slideshow in New Glasgow, hosted by the Northumberland Amateur Photography Society, a successful evening was enjoyed by a full house! "Light & Shadow - the soul of photography" - an interactive seminar given by Yau-Sun Tong, hosted by the Photo Guild of Nova Scotia, Nov. 19th 7:30pm, Museum of Natural History, Halifax, NS. "Adding Impact to Your Travel Photography" - an interactive seminar given by Yau-Sun Tong, hosted by Sackville Photography Club, Oct. 3rd 7pm, Acadia Hall, Lower Sackville, NS. The new itinerary for 2012 Chinese New Year Season Cultural/Photographic Expedition has successfully completed. See summary of this great trip. "Views of China" - a special slide-film presentation by Yau-Sun Tong in the Auditorium of McCain Arts & Social Sciences Building, Dalhousie University, in Celebration of the Chinese New Year. "Pictorial Composition & Design - as I see it" - an unique and lively photographic seminar by Yau-Sun Tong; Jan. 16th 7:30pm in the Nova Scotia Museum of Natural History auditorium. On Nov. 27th, Yau-Sun Tong gave another successful presentation in the Burke Theatre of St. Mary's University in Halifax. The 160-image slide-show "Images from the Ancient Tea-Horse Trails" captured a whole full house of audience. 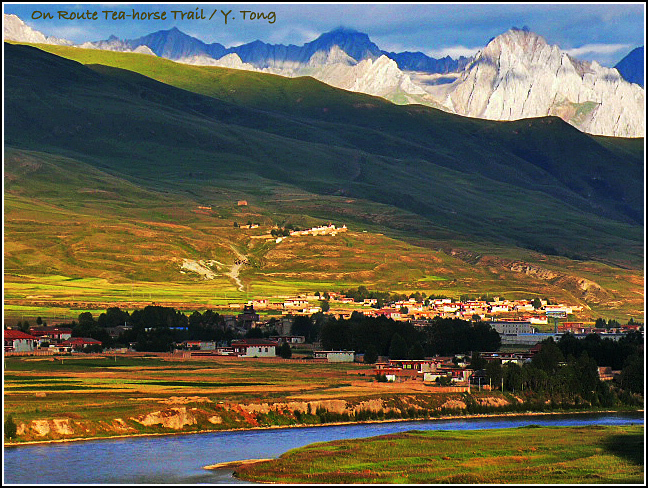 A very special 16-day “Ancient Tea-Horse Trail” expedition! A successful completion! See photo-diary for our "2010 Chinese New Year Season Cultural/Photographic Expedition" to Southwest, Northwest, and Southern China during Feb. 16th - Mar 5th. A simple photo-diary with snapshots from a recent visit to the very northern region of XinJiang Uygur Autonomous Region in China - an area junction with Mongolia, Russia and Kazakhstan: "金秋九月北疆短行 A Sojourn to Northern XinJiang". See detail: PDF flyer on Leica Camera official website. 《漫游妙境－从大西南到吴哥窟》－ this year's feature presentation for "Photographic Guild of Nova Scotia Annual Fall Show" in: Burke Theater A, St. Mary's University, Halifax, N.S. Canada, Saturday 8pm., Nov. 22nd, 2008. Another Successful Tour - "From YunNan to the Golden-Triangle"
"Think, See, Create and Capture: The Strongest Possible Images in Travel Photography"
This Photo Seminar on January 6th was a great success with an audience that overflowed the auditorium in Halifax. Also his seminar Learn to Photograph with Impact, series #1 - "Lighting" on February 9th in Cape Breton was completely enjoyed and cheered by a full house of photographers and fans. You-Sun Tong will present a new slide-show - "Fascinating Southwestern China"
«神奇的中国大西南», with large numbers of images neve r-shown-before, that portray the people and the land of this unique part of the world; as a special feature presentation for the Annual Fall Show of the Photographic Guild of Nova Scotia. It is on Nov. 24th, in Saint Mary's University, Burke Theater A, Halifax at 8 pm. Early in June we have successfully completed our "Special Western China Tour 2007"! You may click on the icon here to view the PDF show for details and photo images from "Top of the World"! As well news for our new itinerary Special Western China Tour 2008! See A Photographic Diary of our "Special Western China Tour 2007"
For the lifetime experience on that mystical land. See the poster for more information. A very special feature slide‑presentation by Yau‑Sun Tong will be presented on the Photographic Guild of Nova Scotia 2006 Annual Fall Show. During his 5,000‑kilometer adventure journey by 4‑wheel‑drive vehicle, Yau‑Sun captured rare photographic images from the region of Ngari – the westernmost region of Tibet Autonomous Region in China. A Journey Around the “Ridge of the Roof‑of –the‑World”, depicts a special land that is particularly difficult to travel to and shows its unique landscapes, tribal people, animals, ancient archaeology sites and much more. The remoteness and the rugged average elevation of 5,000 meters or higher prevent common travelers from ever being able to reach this land of “right‑up‑halfway‑on‑the‑sky”. But it really could be a photographer’s wonderland, besides being a true adventure land. Saint Mary’s University in Halifax, Nova Scotia. On Saturday, November 25th, 8 pm., 2006. Mr. Yau-Sun Tong presented a slide set titled as: "The Fabled Northwest Frontier" 《茫茫大漠西北疆》- a 4th part of a series from his continuous "Western China" Slide-shows, on Nov. 26th, in St. Mary' s University's Burke Education Centre Theatre. The fascinating images in this lively slide show depict the landscapes, peoples and cultures of that unique part of lands in Northwestern China. Large numbers of very positive comments towards Yau-Sun Tong's "The Fabled Northwest Frontier" slide show had been received from participants after the event. On the night of the slide show the theatre was over filled with enthusiastic, attentive and captivated audiences. A comment amongst so many had this: "It was a major success. I can't remember the last time we actually had people sitting on the steps!!" Mr. Yau-Sun Tong is invited to attend the 2004 Abbotsford Photo Seminar in B.C. Canada, to present a program in slide set on China during this 27th APAC Annual Photographic Seminar which will be held October 16- 17, 2004. Starting from Oct 14, all the way till Nov. 27 this year, Yau-Sun Tong will have another solo Photographic Exhibitions. this Exhibition will show case some well printed images from the mystical western China regi.captured by Mr. Tong from the Northwes t as well as Southwest China. A Great Expedition for 2004! In September this year, Mr. Yau-Sun Tong will lead a very special expedition overland by 4-wheel-drive SUVs, starting from Chengdu - the Capital city of SiChuan Province to Lhasa - the capital city of Tibet Autonomous Region. This dream-come-true expedition tour route is not only unique after in China, but is amongst the most desired expedition tours in the world! Only not that long ago, the route was not opened to tourists and in fact any foreigners. Along the 2,500km route through western Sichuan to eastern Tibet; from just couple hundred meters elevation to over 5,000m in elevation; Up over thousands meter high passes, dropping down through lush green valleys and gushing gorges, high mountains and deep canyons, and crossing picturesque landscapes, most distinct local cultures...; not to mention about the photographic opportunities...! 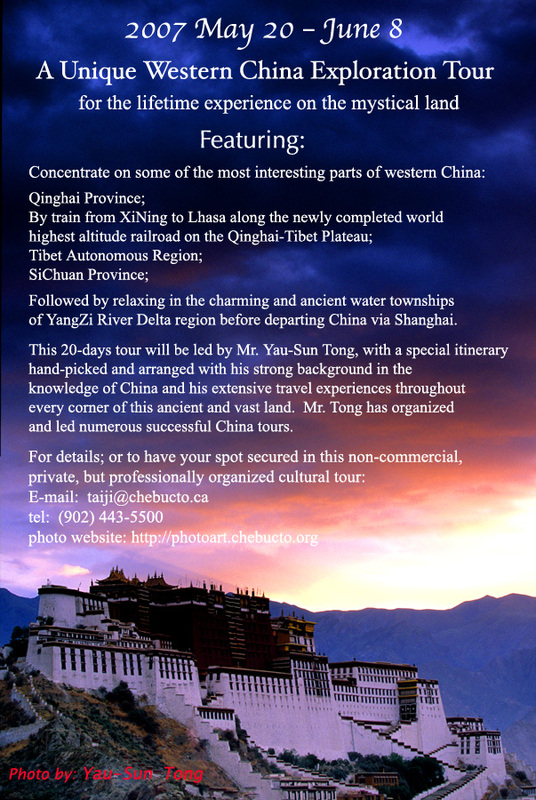 This "Chengdu-Lhasa Tour" is another unique lifetime experience expedition as part of Mr. Yau-Sun Tong's on going effort in providing handpicked best photographic and special leisure tours, for the purpose of promoting better cultural understanding, with his extensive and in-depth experience in traveling all regions of China. For details of this tour starting on September 20, 2004, please contact Mr. Yau-Sun Tong direct via email or telephone to secure your spot. Exciting Photo Tours for 2003!! Feb 14th, a 13 days exciting photo-tour to southwest China for great opportunity in photographing in a unique cultural event as well as landscapes in GuiZhou province, YunNan province. Arrive Beijing from Canada; leave Hong Kong back to Canada. July 19th, a 15 days one of its own kind photo-tour to west China for another great photo opportunity in a unique local festival in remote area of SiChuan province, following with driving through some most interesting regions to GanSu province. Arrive Beijing from Canada; leave Beijing back to Canada. Please contact Mr. Yau-Sun Tong for detail of how to join in this lifetime experience photo-tour, bring lots of films! The "Leica Fantasy China Photo Tours" is a on going photo-tours plan for those whom do not satisfy with just the common stuffs in photography, sponsored by "Lisle-Kelco Limited" of Canada; handpicked spots for best photographic and travel fun opportunities by Mr. Yau-Sun Tong, with his rich experiences in traveling all regions of China, as in arranging successful and unique tours to China. Recently, Mr. Yau-Sun Tong was invited as one of the presenters for the "Camera Canada College 2002" which was taking place in the last week of June in Halifax this year, to present one of his slide show programs of images from the remote western China region. A Photographic Exhibition of Mr. Yau-Sun Tong is displaying in the city of Markham, Ontario, Canada from Feb 8 to Feb. 22, 2002. The Exhibition venue is in Markham Civic Centre lobby, 101 Town Center Boulevard, Markham. A formal opening of this Exhibition was held on Feb 10, Mayor Donald Cousens attended the opening ceremony. "Moments of Truth in Nature and Culture", a special photo exhibition with 46 pieces 12"x18" images, produced and curated by Mr. Yau-Sun Tong, was in display at the City Hall of the City of Toronto at 100 Queen Street West starting July 8th to 12th, 2001. A cocktail reception was held to celebrate this event on July 9th at 5:30p. at the City Hall, about 300 guests attended the opening. This photographic Exhibition had drawn a large audience, as well attracted many media attentions. The photo exhibition showcase the latest works by Mr. Tong during his trips to Tibet and Guizhou, China from 1998 to 2001. It captures the most intriguing moments of local natural and human environment and brings us closer to these most natural land than ever before. It reflects his goal of the mission to reflect the truthfulness in culture and in nature. Special Photographic Exhibition "Moments of Truth in Nature and Culture - China's Tibet and GuiZhou in the Eyes of a Canadian photographer" is co-hosted by the "Confederation of Toronto Chinese Canadian Organizations" and the "Chinese Consulate General". The WFPO (World Folklore Photographic Organization), which originates from the CFPA (China Folklore Photographic Association), and sanctioned by UNESCO, is going to be established this year. The Second Preparatory Meeting is in early June, year 2000, in QuanZhou, FuJian, China. Ancient folklore cultures are rapidly disappearing with the development of modern society. The CFPA and UNESCO believe that photographers around the world should share the responsibility to document and preserve the varieties of traditional cultures, to enrich our social cultural wealth, to strengthen understanding and communication amongst different cultures, to promote peaceful coexistence, and to make greater contributions to the survival and prosperity of the world folk cultures. The CFPA has extended an invitation to Mr. Tong to become one of the founding members of The World Folklore Photographic Organization. Click here to see more information. The CFPA has a website at http://www.china-fpa.org. Experience the dramatic traditional arts of the Nuosu people. This stunning display is the first major North American exhibit that spotlights the cultural revival of this fascinating but little-known culture from the remote mountains of southwestern China. See over 200 striking artifacts, including intricately patterned clothing, elaborate silver jewelry, armor, colorfully lacquered wooden bowls and serving dishes, and unique musical instruments and religious images. Click here to see more details. Located in the busy downtown Toronto, one of Mr. Tong's major Photographic Exhibitions was presented in the City Hall of Toronto. This Exhibition "Images of the Mystical Land - Tibet, China" consists 30 well framed large 12"x18" professional images, selected from the collections of Mr. Tong's own slide images filmed in Tibet, presenting diversified artistic but true views of areas in life, nature, religion and people in Tibet. Mr. Tong will be presenting a photo exhibit entitled "Images of The Mystical Land". Click Here for more information. Recently, the "Leica Fotografie International" magazine published a group of images by Yau-Sun Tong in the #5 issue for July/August '99. "Leica Fotografie International" is a long standing Photographic publication published in Germany in English, French and German, and has a worldwide circulation. One of Mr. Tong's major Photographic exhibitions was presented in the Arts Gallery inside the well known Canadian Historic Building - Pier 21 Halifax, Nova Scotia, Canada from August 1 to August 31, 1999. This Exhibition titled "Images of the Mystical Land - Tibet, China", was hosted by the Multicultural Association of Nova Scotia. All images were high quality 12"x18" archivable photographic prints for Gallery display. According to the venue's data records, an average of 500 people per day visited this Photographic Exhibition during the busy summer month. The Exhibition drew noticeable attention during the month-long exhibit. Five English newspapers including one Canadian national newspaper, and two Chinese newspapers, including the Chinese national newspaper "People's Daily Overseas Canadian Edition", had a total of 13 articles, art reviews, and news reports about this exhibition. The Exhibition is looking for further opportunities to be displayed in other venues in Canada and other countries. Mr. Tong is interested in completing the next Photographic project: "Fascinating Southwest China" , it will be another interesting and exciting exhibition not to be missed! "Capturing the Moments of Truth in Nature and Culture" ...this is the mission statement of Yau-Sun Tong's Photographic Ventures.